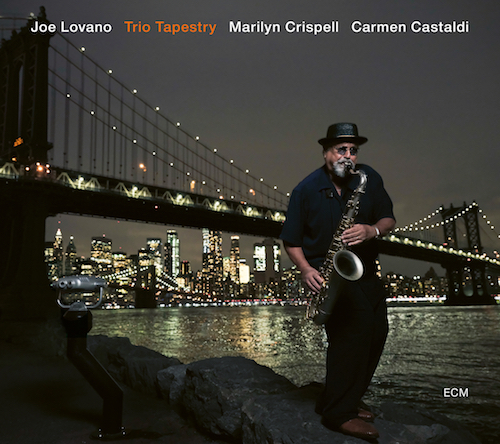 The 2018–19 Art of Jazz Series will present the premier concert by jazz saxophone legend Joe Lovano with his new ensemble Trio Tapestry, featuring Marilyn Crispell and Carmen Castaldi on January 27, at 3 pm in the Auditorium. Series producer Bruce Eaton will host a pre-concert discussion, “Three for the Road,” at 2 pm, highlighting some of the unique trios in jazz history. Tickets are $29 and $24 for Albright-Knox Members and can be purchased at the Albright-Knox Admissions Desk or online at albrightknox.org/artofjazz. Early ticket purchases are highly recommended as Art of Jazz concerts frequently sell out well in advance of the concert date. See JazzBuffalo pre-release preview of Trio Tapestry. Now entering its nineteenth season as the most successful music series of its kind in Western New York history, the Art of Jazz has established the Albright-Knox Auditorium as one of the premier venues to experience live jazz in North America. This landmark season continues the series tradition presenting some of the brightest international jazz stars—from Grammy Award and poll-winners to the next generation of jazz legends. The 2018–19 series will continue with Carla Bley “Trios” (March 17, 2019), and the Edmar Castaneda Trio (April 27, 2019). Individual concert tickets are $29 and $24 for AK Members and can be purchased at the museum or on the Albright-Knox website at albrightknox.org/artofjazz. AK Café serves lunch on Sundays from noon to 3 pm and will serve dinner before the Edmar Castaneda Trio concert on Saturday, April 27. Reservations are essential; please call 716.270.8223 or reserve online using OpenTable.